“Sto. Cristo de Longos is being taken cared of like a child by everyone whose petitions and unspoken prayers were answered by praying before the cross,” thus described sampaguita and candle vendor Norma Martin, 57 the transformation of the miraculous wooden black cross found at the corner of Ongpin and Tomas Pinpin streets in Binondo Manila. Over the years, residents of Ongpin and Binondo were witness to the “wonders” of the Holy Cross, which was later named “Sto. Cristo de Longos”. One of the believers of the four-feet-tall Holy Cross is Aling Norma who claims she had seen the cross “grew up” through the years. “I was only 12 years old when I first saw the Holy Cross here. People would stop for a while to pray,” Aling Norma told People’s Tonight. “Over the years, the wooden cross started to deteriorate. Fortunately, rich people praying to the cross contributed to build an altar and beautify the cross. Devotees have noticed that the cross appears to get taller as well as the heart attached to the center, bigger,” she added. The origin of the Holy Cross remains a mystery up to this time. Betty, a Filipino-Chinese businesswoman, said no one exactly knows when the cross appeared there and who owns it. It doesn’t have a feast day unlike the other icons of Roman Catholics. 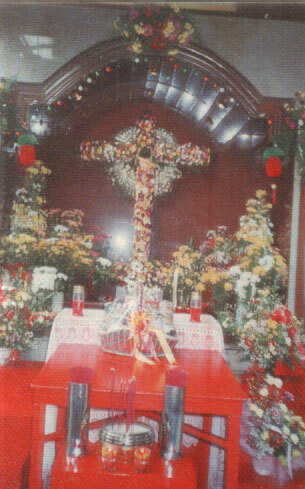 Devotees of the Holy Cross instead celebrate the anniversary or the date when it underwent renovation 10 years ago (1992). To share their blessings, Betty and the rest of her Filipino-Chinese friends and devotees would organize a gift-giving activity each anniversary of the Holy Cross for the benefit of the poor in Binondo. “Nobody knew its name, how old it was and who owned it before people discovered it in Binondo. What the old timers knew is that the Holy Cross has been there during the pre-Spanish time,” Betty said. “They said this cross is just one of the three crosses found in Manila. One in Miserecordia near Mercury Drug in Recto, and the third one found in Makati,” she added. Betty, who manages a Binondo garments factory, disclosed one of the early “miracles” of the Holy Cross could be traced to the original owners of the establishment where the altar of the Holy Cross is attached. “Stories have it that three stockholders bought the lot where the Holy Cross is located. One of the three businessmen has decided to have the cross removed as it would hinder to the construction of a new building. Not long after the incident, the stockholder became blind. He promised to build an altar for the cross and he was able to regain his sight,” Betty said. Candle vendor Norma recalls how the Holy Cross answered her prayers when a fire destroyed hundreds of houses in her neighborhood in Caloocan sometime in the 1980s. “I was tending to my store when one of my neighbors informed me that our area is being destroyed by flames. I cannot just abandon my store, so what I did was to look up to the sky and pray to the Holy Cross that the fire would not reached our house,” the mom of six said. “When I arrived home, I cried in disbelief. Our home was spared from the destruction by fire,” she said. Upon seeing the cross the following day, Norma reached out to the cross and and cried for joy. “When I got here the following day, I embraced the cross, I cried and thank Him (God) because He answered my prayer,” Norma said. The old lady said the Holy Cross is guiding her all through these years. People from different walks of life and even races (Filipino, Chinese, Filipino-Chinese, Indian) would visit the Holy Cross to offer and pray for their intentions. Those whose prayers were granted would still visit the cross to give an offering or sponsor a thanksgiving mass. Those who has lesser in life would give sampaguitas and candles as their offerings. Minyang Barredo, 52, of Amorga, Tondo, Manila, claimed the Holy Cross saved her life after a vehicular accident and even accompanied her to the hospital. “We are devotees of the Holy Cross since 1990. In 1992, I met an accident in Cavite. I sustained a fractured skull and broken ribs. At the hospital, a man told me that he already contacted by employer and that she will send a representative to fetch me,” Minyang said. “Mang Ando, the truck driver who hit our car, said it’s a good thing someone is taking care of us at the hospital. He said someone (a man) is sitting beside me and rubbing my back,” she recounted. Minyang thought she never had any companion at the hospital except her sister. “The only person who was with me at the hospital was my sister. But Mang Ando and the other patients and their companions who were at the same room confirmed that there was somebody else. They described him as wearing a green-leaf cloth, but they couldn’t remember his face,” Minyang said. “It was the start of so many miracles and blessings manifested by the Holy Cross in our lives, ” she added. Norma recalled an incident when a drug-crazed man approached the cross and stabbed it several times puncturing the brass cover of the icon. “The drug-crazed man was about to leave the altar when he suddenly collapsed and died on the same spot,” Norma said. This entry was posted in Inspirational and tagged black cross, black cross longos, miracle, miracle cross, miracles of the wooden black cross, sto. nino de longos, wooden black cross on April 3, 2012 by Yami. Simula sa araw na ito, July 30, 2013 ako ay magiging isang masugid na deboto na nang mapaghimalang Sto. Cristo de Longos sa panulukan ng T. Pinpin at Ongpin, Maynila.